When I work with a large monitor, I often divide my Emacs frame (what most people call a window) into two or more windows (divisions within a frame). I like this more than dealing with multiple Emacs frames, even if I could spread those frames across multiple monitors. I find it easier to manage the windows using keyboard shortcuts than to manage the tiling and display of frames. 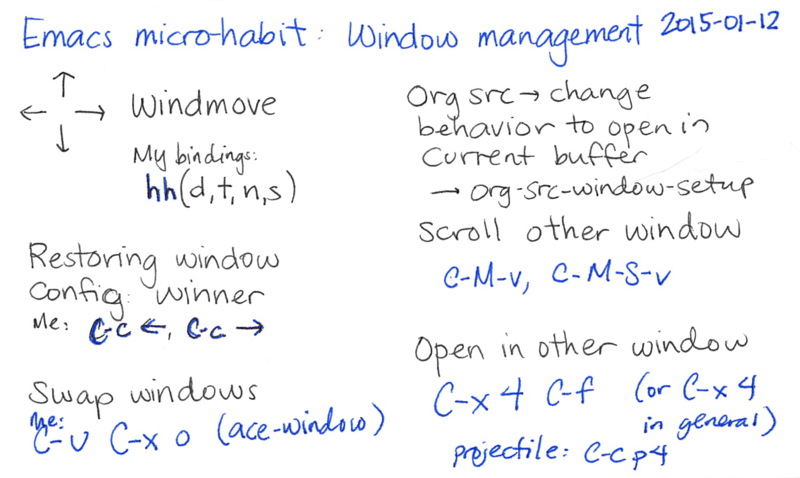 One of the Emacs micro-habits I’m working on is getting better at switching between windows. When there are only two windows, C-x o (other-window) works just fine. However, when there are three or more, it can take a few repetitions of C-x o to get to where I want. I could get around that by binding other-window to M-o instead, replacing the default keymap for that. Or I could try to get the hang of other ways to move around. Windmove lets you move around with cursor keys, if you set up the appropriate keyboard shortcuts. 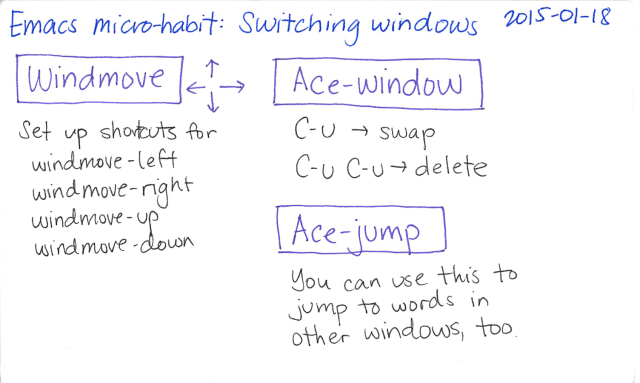 Ace-window works like ace-jump. In addition, you can use C-u to swap windows and C-u C-u to delete windows. Ace-jump works across windows, so that’s handy too. Here’s my relevant code snippet for Windmove. I changed this to use define-key instead of bind-key. Naturally, after recording the video, I thought of a better way to manage my windows. I took advantage of the def-repeat-command that abo-abo posted on (or emacs so that I could repeat keybindings easily. I modified the function to accept nil as the first value if you don’t want the keymap to run a command by default, and to use kbd for the keybinding definitions. "Return a lambda that calls the first function of ALIST. allowing you to repeat those functions as needed." Here’s my new binding for yy. 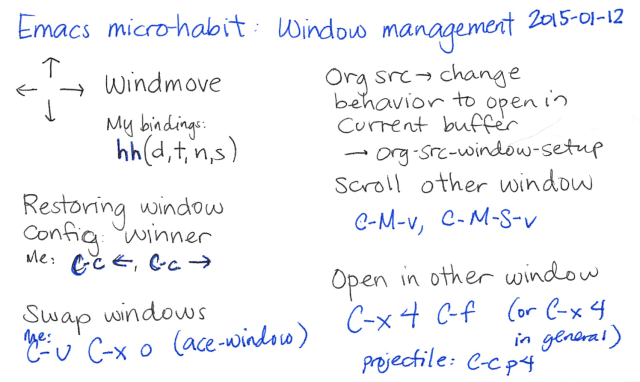 It lets me bounce on y to use other-window as normal, use the arrow keys to move between windows thanks to windmove, and use ace-window as well: h is the regular ace-window, s swaps, and d deletes.